Freebies for fans! Have you “Liked” our Paper Garden Projects Page over on Facebook yet? 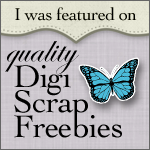 Our Facebook Friends get access to freebies and special offers. We’d love to have more friends, so come on over. If you’re already a fan, you can download this free kit by clicking on the Freebies for Fans tab on the left side of the page. If you’re not a fan, simply click the “Like” button and you’ll have instant access to download the kit using the Freebies for Fans tab. This entry was posted in Uncategorized on October 18, 2011 by Cathy. Hopefully pasting this link will help. Yeeeee!! I can now see your facebook page.